In this important study, which should be of interest to both scholars and policymakers, Paul Miller examines the practice of armed state building by both the United States and the United Nations. While acknowledging that there are some characteristics of armed state building by liberal powers that are similar to the theory and practice of traditional imperialism, Miller argues that there are important differences between the two concepts. In his definition, “Armed international liberal state building is the attempt by liberal states to use military, political, and economic power to compel weak, failed, or collapsed states to govern more effectively and accountably, as understood by Westphalian and liberal norms”(7). Paul D. Miller. Armed State Building: Confronting State Failure. Ithaca: Cornell University Press, 2013. ISBN: 978-0-8014-5149-2 (hardcover, $35.00). Why do some of these efforts at liberal armed state building succeed while others fail? Miller’s central argument is that efforts at armed state building have to be built on a correct assessment of the type of state failure that exists in any given case; he suggests that there are five distinct types of state failure (9). Getting the diagnosis right about the type of state failure which potential intervenors are faced with is crucial because Miller argues that the “single most important policy recommendation resulting from this book is that policymakers should tailor a strategy of intervention to the conditions on the ground in the state they wish to rebuild” (186). H-Diplo/ISSF thanks Dr. Miller and all of the reviewers for contributing to an important theoretical and policy-relevant debate about the past, present, and future of armed state building in world politics. Paul D. Miller is the Associate Director of the Clements Center for National Security at the University of Texas at Austin, and an adjunct political scientist at the RAND Corporation. Miller previously served on the National Security Council staff as Director for Afghanistan and Pakistan under the George W. Bush and Barack Obama administrations. He holds a Ph.D. in international relations from Georgetown University and an M.A. in public policy from Harvard University. Seth G. Jones is director of the International Security and Defense Policy Center at the RAND Corporation, as well as an Adjunct Professor of Strategic Studies at Johns Hopkins University’s School for Advanced International Studies (SAIS). He is the author of Hunting in the Shadows: The Pursuit of al Qa’ida after 9/11 (W.W. Norton, 2012), In the Graveyard of Empires: America’s War in Afghanistan (W. W. Norton), and The Rise of European Security Cooperation (Cambridge University Press, 2007). He served as the representative for the commander, U.S. Special Operations Command, to the Assistant Secretary of Defense for Special Operations. Before that, he served as a plans officer and advisor to the commanding general, U.S. Special Operations Forces, in Afghanistan (Combined Forces Special Operations Component Command–Afghanistan). Kyle M. Lascurettes is an Assistant Professor of international affairs at Lewis & Clark College in Portland, Oregon. His current book project investigates why powerful countries have promoted vastly different visions of international order throughout history when they have had opportunities to do so. Kimberly Marten is the Ann Whitney Olin Professor of Political Science at Barnard College, and a faculty member of both the Graduate School of Arts and Sciences and School of International and Public Affairs (SIPA) at Columbia University. She directs the new Program on U.S.-Russia Relations at Columbia’s Harriman institute, and is a life member of the Council on Foreign Relations. She has written four books; the most recent is Warlords: Strong-Arm Brokers in Weak States (Cornell, 2012). She has made guest appearances on “The Daily Show” with Jon Stewart, “The Charlie Rose Show” with guest host Richard Haass, MSNBC’s Rachel Maddow show, and NPR’s “Fresh Air” with Terry Gross, and is a frequent guest on WNYC radio’s The Takeaway. On August 23, 2011, Libyan insurgents in Tripoli overran the fortified perimeter of Muammar al-Qaddafi’s headquarters, the Bab al-Aziziya, and brazenly stormed the compound. “It’s over! Qaddafi is finished!” yelled one fighter over the clamor of celebratory gunfire, as rebels raised their red, green, and black flag over the building. Libyan insurgents, or thuwwar, then proceeded to shatter a gilded statue of Qaddafi, tear up a portrait of the Libyan leader, and raze parts of the building. The same day, thuwwar also seized control of the Tripoli airport and key neighborhoods of the city, as a growing flock of rebel supporters danced in Tripoli’s Green Square. The victory was startling in its speed and lethality, overthrowing Qaddafi’s government in only six months. Outside support was pivotal. Beginning in March 2011, American, French, and British aircraft began targeting Qaddafi’s air-defense systems. U.S. and British ships fired 110 Tomahawk missiles that struck Libyan radar, missile, and command and control sites. Overall, NATO aircraft conducted a total of 26,500 sorties against the regime’s armored vehicles, artillery, and other targets, and provided rebels with an opportunity for victory in Libya. The air campaign also enabled the Benghazi-centered Libyan opposition to survive Qaddafi’s offensive in March 2011, which might have overrun the insurgent stronghold and potentially crushed the opposition. But unlike a range of prior cases, from the Balkans to Afghanistan and Iraq, NATO countries did not become involved in state building in Libya. NATO governments – including the United States, France, and Britain – refused to spend the money, deploy the soldiers, or provide the resources to rebuild Libya. For U.S. policymakers, the challenges in Iraq and Afghanistan had discredited state building and, as President Barack Obama argued, “it is time to focus on nation building here at home.” But Libya quickly faced massive challenges. The bureaucracy collapsed, well-armed militias controlled much of the countryside, and the Islamic State and other Salafi-jihadist groups took advantage of the vacuum. Based on the Libya experience, is it possible that U.S. and other Western officials learned the wrong lessons from history? 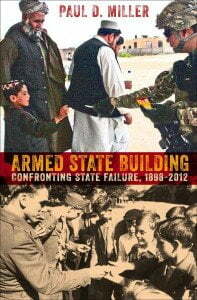 Paul Miller has written an insightful book, Armed State Building: Confronting State Failure, 1898-2012, to help us migrate through these murky waters. He focuses on ‘armed state-building,’ which he defines as the attempt by liberal states to use military, political, and economic power to compel weak, failed, or collapsed states to govern more effectively. Miller asks a series of provocative questions: Under what conditions, if any, can outside powers or international institutions strengthen and liberalize weak states? What strategies of state building are most appropriate to the different conditions of state failure? And what causes the success or failure of armed state building campaigns by liberal powers (3)? Miller’s argument focuses on the role of strategy. He contends that there are different types of state failure and, therefore, there are different strategies of state building required for different circumstances. Armed state building is more likely to succeed when state builders match their strategy to the type and degree of state failure in the target state. Miller claims that states can fail in one of five ways. A state can be anarchic where its security apparatus has collapsed, illegitimate among its population, incapable of providing goods and services, economically unproductive, or barbaric by committing gross human rights abuses (53-69). Prospective state builders, in turn, can choose one of three types of missions. They can observe, monitor, and encourage reform (an observer strategy); build infrastructure as well as train, equip, and advise people to implement reform (a trainer strategy); or assume control and directly administer reforms (an administrator strategy). The secret, he maintains, is to match the strategic degree of invasiveness to the degree of failure in each dimension (83-116). In short, for armed state-building to succeed, government and international institutions need to choose the following strategies: (1) an observer strategy for aspects of the state that are weak but still functioning; (2) a trainer strategy for aspects of the state that are no longer functioning but where there are still local citizens willing to lead reform efforts; and (3) an administrator strategy for aspects of the state that have collapsed and where there are no locals willing or able to lead reform and reconstruction. State-building outcomes, consequently, are a function of the match, partial match, or mismatch between the international state builders’ strategy and the type and degree of state failure present in the target state. Armed State Building is a useful contribution to the broader literature on state-building, civil war, insurgency, and related subjects. The book’s argument is clear and its policy implications are fairly straightforward. There is no master strategy that will work in all state-building cases, but policymakers need to adjust their strategies to local conditions. Miller also takes aim at several competing explanations. In response to those who argue that it is more effective to focus first on promoting democracy and economic liberalization, building state institutions, or establishing security, he contends that there is little evidence that “sequencing” matters. He also maintains that there are problems with other explanations. Examples include those that focus on the presence or absence of security, gross domestic product (GDP) per capita, or multilateral operations as the key independent variables. Despite its contributions, however, there are several challenges with Armed State Building. To veritably test the argument, Miller would have needed to have taken such steps in his forty cases as: measuring the degree of state failure in all five areas (security, legitimacy, capacity, prosperity, and humanity) at various periods; identifying the ideal strategies (observer, trainer, or administrator) necessary to deal with state failure in each of the five areas; identifying the strategies actually adopted by international and local state builders at various periods; analyzing the matches and mismatches between state failure and strategies; identifying the causal mechanisms; and assessing how competing explanations perform. Doing this well would be difficult and imprecise. But it is only done for five of the forty cases (13 percent). These cases include: West Germany (1945-1955), Nicaragua (1989-1992), Liberia (1993-1997 and 2003-present), Sierra Leone (1999-2006), and Afghanistan (2001-2010). This does not mean that the argument is necessarily wrong, just that it is largely untested. But it does raise questions about whether Miller’s argument has more explanatory power than the alternatives. It would have been a worthwhile plausibility probe to show how his theory fares against the universe of cases, particularly compared to alternatives. After all, the success of any theory is its ability to explain a set of cases better than competitors. Indeed, the independent and dependent variables are not clearly operationalized or tested. More broadly, there are some hurdles in accurately testing the argument. First, measuring ‘strategy’ is complex. After all, whose strategy should be measured? In virtually all state-building missions, there are numerous outside governments, international institutions, non-governmental organizations, and local actors (including the local government). It is common to find different – and sometimes competing – strategies among these actors. Second, the level of insecurity, legitimacy, capacity, prosperity, and humanity can vary – sometimes drastically – before and during a state-building mission, raising questions about when to measure these variables and compare to state-building strategies. Even in Miller’s five cases, the theory doesn’t necessarily fare as well. Take Afghanistan. Miller is correct that early strategies were generally inadequate. He argues, for example: “From 2001 to 2006, the international community largely adopted the wrong strategy for rebuilding the Afghan state’s security and capacity. The international community did not tailor a strategy calculated to fit Afghanistan’s needs” (161). Setting aside whether there was such a thing as an international community strategy, international resources were indeed extraordinarily low for an Afghan state with virtually no institutional capacity. But U.S. and NATO’s security strategy began to change. By 2010, there were approximately 100,000 U.S. troops and 40,000 other foreign troops in Afghanistan and a focus on population-centric counterinsurgency. Yet the security picture did not drastically change. Miller maintains that there was a drop in violence beginning in 2011, which was caused by a change in strategy. Yet violence levels are not a particularly useful indicator for security. In some Taliban-controlled areas, violence levels dropped because NATO and Afghan forces did not contest Taliban control. Other metrics show a more complicated picture in Afghanistan. According to some polling data, the number of Afghans who said they feared for their personal safety increased after the surge of U.S. and other foreign forces. This suggests that a better match between security strategy and the type and degree of state failure will not necessarily lead to better outcomes. One reason may be that there are several exogenous variables – such external support to insurgents – that lie outside of the theory. For example, Pakistan provided lethal and non-lethal assistance to the Taliban and other groups, as well as gave insurgent leaders sanctuary in such Pakistan areas as Baluchistan Province. In addition, other areas – such as waning legitimacy for the Afghan government – may have impacted security, since many Afghans were angry at Kabul’s lingering corruption and ineffectiveness in delivering goods and services. Still, Armed State Building makes a useful contribution. Its argument that strategy matters across such areas as security, legitimacy, capacity, economic prosperity, and humanity is an important one. So is the book’s emphasis on paying close attention to the type and degree of state failure. Moving forward, the right question is not whether the United States and other Western countries will engage in armed state building again. They certainly will, despite their reluctance to conduct operations in Libya. Rather, the more appropriate question is whether outside powers will be more successful in the future. If so, Armed State Building is a valuable resource. Paul Miller’s excellent book makes a number of critical contributions to the study of armed intervention and state building. In this review, I discuss what I believe to be three of its most important strengths before raising one point of contention and posing a number of questions about the policy implications of the book’s principal findings. Armed State Building is, first, an unusually strong study in defining, developing, and differentiating important but contested concepts. Good concept formation is especially crucial here because Miller is diving into particularly murky conceptual waters. In spite of countless other monographs on these topics, the precise meanings of terms like “state building” and “state failure” remain nebulous and heavily contested. Scholars and policymakers frequently talk past one another on these topics because they disagree on foundational definitions. The first half of Armed State Building should be held up as a model for graduate students of rigorous and well-defended conceptual work. Early on in the book, Miller cleanly defines armed state building as “an exercise of military power by great powers to compel failed or collapsed states to govern more effectively” and convincingly justifies this definition relative to others (4). In focusing on modern cases of liberal armed state building in particular, he also successfully disentangles armed state building from related and often intertwined concepts like imperialism, international development, peacekeeping, and conflict resolution. After building a strong case for his conception, Miller clearly establishes the universe of cases for liberal armed state building, identifying forty instances of American- or United Nations-led intervention since 1898. Miller’s conceptualization of intervention success or failure is also insightful. By using the target states’ trajectories before armed state building interventions as the baseline by which to measure success and failure, he avoids the pitfall of anchoring his study to some contested and western-imposed standard of success (14-17). Comparing pre- and post-intervention trajectories in this way also bolsters the credibility of one of the book’s more surprising conclusions: armed state building works, and on average does much more good than harm if the alternative is leaving failing regimes to sort out their own troubles (e.g. 178). Overall, the book’s core conceptualizations are well reasoned and the measurements of these concepts well specified and measured. If all students and practitioners of armed state building were to embrace Miller’s definitions and measurements, the study of this important topic would be better for it. Second, but related, the book’s treatment of “statehood” and “state failure” are particularly strong and merit special attention. Chapters three and four offer nothing less than a comprehensive discussion of what a state is, what it has been and what it should be in the contemporary world. In chapter three, Miller disaggregates the elements necessary for a regime to achieve “statehood” into five categories: the ability to exercise effective coercive force against internal and external adversaries; a widely accepted right to rule grounded in a legitimate theory of justice; the capacity to act as the primary provider of public goods; the means to promote economic prosperity (or at least the potential for it); and, more broadly, the will and wherewithal to protect the most basic of human rights for all citizens. Flipping this conception around, chapter four details how the breakdown of each of these five elements constitutes a separate and distinct kind of state failure. While it is common parlance to use “failed state” as a blanket catchall for countries with major problems, Miller effectively argues instead that state failure is not simply one thing. Failure comes in five distinct forms, each corresponding to one of the positive elements of statehood justified in chapter three. Failed states can thus be anarchic, illegitimate, incapable, ineffective, barbaric, or, as is often the case, some combination of multiple failures. One could quibble with the details of these conceptions. Is supplying public goods really distinct enough from assuring a viable economic environment to justify separate categories? Are human rights violations, no matter how systemic and deplorable, always automatically grounds for inferring that the state in question has “failed”? The fact remains, however, that Miller has done an admirable job grounding his analysis of armed state building in a comprehensive and well-reasoned conception of statehood. Third, and finally, the book’s thorough conceptual work dovetails nicely with the core of the study, Miller’s own theory of armed state building success and failure. The central thesis of the book is that armed state building is most likely to succeed when the doctors (intervenors) successfully match the type and intensity of the treatment (state building measures) to the type and intensity of the patient’s disease (state failure). For example, an anarchic and barbaric failed state will require a fundamentally different international response than one that is incapable and ineffective, or illegitimate in the eyes of its citizens. Beyond this, even states suffering from the same type(s) of failure will often differ in the intensity of that failure, requiring intervenors to adopt distinct types of intervention strategies. While intervenors can monitor and encourage local actors to make the necessary reforms (O for “observing”) in lower levels of state failure, they must play a more active role in training and equipping these actors (T for “training”) as the depth of failure increases. In instances of complete failure, intervenors must assume complete control over vital services (A for “administering”) for some period of time if they hope to stem the tide of state failure in a meaningful and sustainable way. By the time this logic is fully explicated in chapters five and six, it becomes clear why the detailed conceptual work earlier in the book was so necessary: armed state building success is predicated on intervenors aligning their state building strategy with the appropriate dimension(s) of state failure for the particular target state. And in order to successfully match medicine to malady, Miller argues, scholars and policymakers must comprehend the disparate sources of statehood and corresponding pathways to state collapse. Rarely in a book-length study does such detailed conceptual work come together so neatly with meticulous theory building as it does here. These impressive strengths notwithstanding, there are two areas where I would like to probe a bit further. The first pertains to the theory and the evidence marshaled to support it. The second involves an underexplored finding from the case studies. Both points, I argue, could have important implications for the book’s practical lessons and policy prescriptions. Given Miller’s articulation of his matching theory throughout the book, one could reasonably expect that the theory’s ‘heavy lifting’ would center around the match or mismatch of intervenors’ state building strategies with the type(s)/pathway(s) of state failure in the target states. This, after all, is the book’s first hypothesis: “Armed state building is most likely to succeed when state builders prioritize a goal that is tailored to address the specific type of state failure that exists in the target state” (76). The case studies, we would expect, should show how intervenors who focused too much on security or legitimacy for incapable or barbaric states had failed, while those who successfully matched strategy to type of failure—focusing on rebuilding economic institutions for unproductive states, for example—often succeeded. I found instead that the evidence marshaled in chapters six and seven supported not this first expectation, but the second hypothesis that is comparatively less highlighted throughout the book: “Armed state building is most likely to succeed when state builders adopt a higher level of invasiveness for higher degrees of state failure and higher state-building ambitions” (78). To put this another way, Miller’s explanations for particular state builders’ successes or failures—both in anecdotal evidence presented in chapter six and in the deeper case studies of chapter seven—are almost always framed as hinging on level-of-invasiveness decisions rather than those of strategy type. In each case of partial or full armed state building failure in chapter seven in particular, Miller links failure to the intervenors implementing inappropriate level(s) of control. State building failures are explained by mismatches, yes, but mismatches of invasiveness/control, not of state failure type. There is potential for a logical explanation here that still fits with the core theory: perhaps inadequate levels of invasiveness/control stem from the intervenors’ larger misplaced priorities related to the type of state failure. Had officials properly understood that state failure in country X stemmed more from incapable economic institutions than from an anarchic security environment, for example, they would have devoted fewer resources to security in order to focus much more on (and demanding more control over) restoring productivity. This, then, would fit the broader framing and central argument of the book: state building failures follow from misdiagnosing (or simply not examining) the root causes of state failures. The case studies do not develop this line of reasoning, however. In my view, none of the cases of armed state building failure in chapter seven show intervenors misdiagnosing the actual causes/dimensions of state failure. To the contrary, intervenors that erred always did so by going in too light—thereby not exercising enough control in the target states to succeed—either within a particular dimension or in multiple dimensions of state building. Specifically, armed state building failed partially in Nicaragua, (T needed on security, legitimacy, prosperity and humanity; mostly O adopted), initially in Sierra Leone (A needed in security and capacity; O and T adopted), completely Liberia (needed mix of A and T across dimensions; mostly O was adopted), and partially in the first period examined for Afghanistan (A needed in prosperity and security; O and O/T adopted). In none of these instances does Miller account for the intervenors’ failure to exercise adequate control by pointing to their focus on or overcommitment to the wrong dimensions of state failure. In short, while Miller’s matching theory is logical, plausible, intuitive and in many ways appealing, I found little evidence from the empirical investigations that armed state building success or failure was predicated on the factor deemed most central to that theory. This point, if valid, has implications for the study’s policy prescriptions. Miller’s principal recommendation in the concluding chapter is that intervenors must better inform their state building strategies with area expertise. If the case studies had shown policymakers consistently misreading the nature of the target states’ failures, this recommendation would certainly make sense. Yet if instead the intervenors’ level-of-invasiveness decisions were more decisive in explaining armed state building success and failure as I have argued here, two of Miller’s later and less highlighted prescriptions seem more critical than ramping up area knowledge and expertise: a warning to pay much greater attention to initial strategic level-of-control decisions, and advice to policymakers to base such decisions on the needs of the target state rather than their own domestic or international political constraints (186-187). Because “[a]rea experts are unlikely to be best suited” to make these crucial decisions involving level of commitment and control as Miller freely admits (186), the relative priority assigned to these different policy recommendations matters, and could mean the difference between success and failure in future interventions. This discussion of level-of-control decisions highlights a second point that I raise less in criticism, more in question: can intervenors ever adopt strategies that are too invasive and controlling? And even if they can err in this way, do they? In theory, Miller says yes. “An overbearing state-building strategy,” he tells us, “may provoke the worst behavior” from friendly and hostile local actors within the target state alike, engendering free-riding and buck-packing behavior in the former while fomenting even more hostile resistance from the latter (79-80). The prescription that follows, quite naturally, is that intervenors must be careful to get level-of-invasiveness decisions just right (188). Yet across the universe of cases Miller explores, I found no instances of a) armed state building failing because of a state building strategy that was too invasive, or even b) of state builders adopting more invasive strategies than necessary in the first place. It seems instead that intervenors always erred by going in too light and never from being too heavy handed, at least in the cases Miller surveyed for this study. If this is indeed the case, one could reasonably wonder whether policymakers should simply always adopt as invasive and controlling a strategy as possible when attempting armed state building. I doubt this is a prescription that would fit comfortably with Miller’s argument, especially given his normative defense of armed state building against charges of imperialism and exploitation in the book’s final pages (194-204). Nonetheless, the book’s case investigations simply do not show the pitfalls inherent in adopting maximally invasive and controlling intervention strategies wherever armed state building is attempted. In spite of these questions, one of Miller’s most important policy prescriptions still cleanly hits its mark: the search for a one-size-fits-all solution to state failure is destined to fail. Both local conditions and historical context matter, and a perfect recipe for successful state building cannot be concocted in a social science laboratory. Or, as Miller puts it in his conclusion, officials would be wise to learn once and for all that they “cannot design appropriate shelf-ready strategies in advance of a state failure because it matters how states fail” (188). If Armed State Building successfully imparts even this single lesson and nothing else, it will have been well worth the effort. In Armed State Building, Paul D. Miller of the RAND Corporation combines the practical knowledge he gained working on U.S. military and state-building efforts in Afghanistan with a deep analysis of the literature on state failure and state building. He sensibly argues that armed state building will work best when decision-makers design their strategies and prioritize their goals around the political and economic realities of what they find on the ground. Beginning with the U.S. military deployment to Cuba 1898—where Miller explains that the sovereignty of the target state was officially maintained, in contrast to other simultaneous efforts undertaken by the administration of President William McKinley, like that in the Philippines—the book goes on to consider 40-odd armed state-building efforts undertaken by the U.S. and the United Nations, mostly through the use of large-N correlations. Miller crafts more detailed case studies of five armed state building examples, including post-war Western Germany, Nicaragua, Sierra Leone, Liberia, and Afghanistan, which show varying degrees of match and mismatch between operational design and on-the-ground situations. His goal is to understand what accounts for the success or failure of various armed state-building efforts over time. Miller demonstrates that too often, intervention for state-building purposes is based on wishful thinking and strategies that poorly match the characteristics of the actual state failures at hand. In three of his case studies he shows, nonetheless, that the strategies of armed interveners can sometimes be changed midway through the process to better reflect the actual situation of the failed state. In Sierra Leone, United Nations peacekeepers initially moved too weakly to reorient the power balance among spoilers, but British intervention and an expanded UN mandate led to what Miller terms a clear success (145). In Liberia, the initially limited UN mandate of 1993 was incapable of addressing the actualities and humanitarian cruelties of anarchy and state illegitimacy. But by 2003, when a more experienced UN Security Council returned to the problem, the redesigned mission in Liberia was a much better fit, leading to more lasting peace. Miller closes his case-study section with a discussion of changing international strategies in Afghanistan in the late 2000s. The book may be a bit too hopeful about the benefits of the strategy shift that began in 2006, given what we now know about recent developments in the country as violence looms once again; but it would be unfair to expect the author to have predicted the future of an ongoing conflict. The book includes a superb review of the existing literature on state-building, featuring a valuable critique of the notion that the proper sequencing of actions and strategies is a universal solution to state-building problems. Miller also provides useful criticism of the literature on state failure, and helpfully unpacks the relationship between coercion, justice, and the provision of public goods in how the field defines state strength and success. The book nonetheless has a major weakness: Miller takes for granted the notion that statehood is in itself a good thing, and (for most of the book) that the primary goal of intervening powers is indeed to build truly sovereign states (although he relaxes this assumption in the conclusion). He defines “armed state building” as “an exercise of military power by great powers to compel failed or collapsed states to govern more effectively,” (4) arguing that this invariably involves the requirement to “alter local balances of power” in order to “compel weak states to abide by norms of statehood” (5). This definition leads to three problems with the book, all connected to what is arguably Miller’s idealization of such statehood. First, Miller does not grapple with the literature that questions whether the norm of sovereign statehood makes practical sense in all situations, particularly for post-colonial states with artificial borders whose capitals are geographically removed from outlying areas. While some of this challenging work, such as the 2011 volume edited by Thomas Risse of the Freie Universität Berlin, may be too recent for Miller to have covered in his own 2013 book (given the realities of delayed academic publication schedules), there is a rich older tradition of questioning the meaning and value of sovereignty, particularly among Africanists, that Miller does not mention. Related to this, Miller glosses over the fact that many strong, sovereign states do not serve the interests of their populations. He lists “barbaric states” that “deliberately murder [their] own citizens” as a type of failed state (65). But Joseph Stalin led the Soviet Union for over 25 years, building it into a modern military-industrial great power and vanquishing Nazi Germany even as he murdered untold numbers of his own citizens; Augusto Pinochet led Chile for 17 years as a U.S. ally, no less. Both states were horrific, but it would take a leap of logic to define them as “failed states” similar to Afghanistan or Liberia. Beyond these egregious examples of state inhumanity, the sociologist James C. Scott has published well-regarded criticism of the value of statehood as a moral good in the eyes of its own inhabitants, including those who have preferred to evade taxes and conscription by escaping to states’ geographical peripheries. Those arguments are not considered by Miller. Second, Miller’s focus on de jure sovereignty causes him to miss the important similarities between the imperialism practiced by liberal states at the turn of the twentieth century and more recent state-building projects. His distinction between U.S. intervention in Cuba and the Philippines in 1898 is hence artificial, causing him to miss out on the lessons that could be learned from a host of additional liberal imperial cases. Miller cites my book on this subject but draws out only one of its arguments (on the sequencing of security provision and political system change), rather than contending with its overarching framework that compares liberal empires to peace enforcement operations. Britain, France, and the U.S. all pursued imperial projects with the eventual stated goal of helping what they thought of as benighted peoples to govern themselves. A good argument can be made that international intervention in Bosnia, Kosovo, East Timor, Afghanistan, and Iraq bears some striking similarities to these earlier efforts, differing because of the limited timeframes of these more recent interventions, their multilateral leadership, and their efforts to spare civilian casualties—not because of overarching political goals or state-building activities. The idea that today’s state-building can be compared to earlier liberal empire efforts is shared by Max Boot (whose book is similarly cited but not engaged by Miller) and Michael Ignatieff (who is not cited by Miller), among others. Third, it is arguable whether today’s intervening powers are motivated only or even primarily by the desire to build sovereign states. Self-interest, not the mitigation of state failure, explains why the U.S. and its Western allies have intervened (including through the U.N. Security Council) in some cases but not others, at times standing aside completely (as in Rwanda), and at others limiting themselves to airstrikes (as in Libya or Syria). Miller avoids dealing with this conundrum by selecting cases only where military intervention occurred (205). In addition, true sovereignty is not always the ultimate goal of intervention, as Miller recognizes in his conclusion (197-9). The interveners may not even be consistent among themselves in this regard; for example, it is well documented that the U.S. Central Intelligence Agency used cash to buy off warlords in Afghanistan for the sake of stability, even as this undermined the democratic state-building efforts of the U.S. State Department. Indeed Miller’s criteria for case selection does not determine whether sovereignty was the ultimate goal of the intervention; instead it includes mandates focused on externally manipulated political change (for example, national reconciliation and the use of a transitional authority, 207). As Stephen D. Krasner pointed out fifteen years ago, de jure sovereignty does not always capture the de facto reality of external influence in weak states. When push comes to shove, the purpose of intervention is determined by the self-interests of the intervening states—not the abstract goal of state-building for its own good. While Miller’s book does not resolve all of the internal contradictions it raises, Armed State Building provides useful lessons for those contemplating future military state-building interventions after Iraq and Afghanistan. It will prove essential reading for those in the policy community who forget how easily good intentions can slide into disaster, as state-building becomes mired in the messy reality of local political actors and goals. I am honored by the attention H-Diplo has brought to my book, Armed State Building, and thank the reviewers for taking time to read and discuss it. In my book I ask what causes the success or failure of armed liberal state building projects, such as the international community’s undertaking in Afghanistan since 2001. I review the history of such efforts and find precedents as far back as the U.S. intervention in Cuba in 1898. I argue that the phenomenon of international state building is best understood by disaggregating the concepts of statehood, state failure, and state building. States have five aspects to them (security, legitimacy, capacity, prosperity, and humanity) and can thus fail in five ways (yielding insecure, illegitimate, incapable, impoverished, and barbaric types of failed states). Intervening powers have a choice about how intensive or invasive their project will be, along each aspect of statehood. I argue that state building works when intervening powers adapt the invasiveness of their presence to match the level of failure in each aspect of statehood. The more broken it is, the more work it will take to fix. The reviewers raise some challenging empirical and theoretical questions. Jones also takes issue with my reading of the Afghan case, on which both he and I have written extensively. I do maintain that security in Afghanistan improved in 2011-12, at the height of the U.S. troop surge there, and I supported that contention with a range of evidence, including but not limited to the frequency of violence, which Jones seems to have missed. I’m uncertain if Jones would claim that security showed no improvement at all during the key years—which would be highly questionable—or, if he does acknowledge that security improved, how he would account for the improvement if it was not a result of the international community’s changed strategy. In my view, the strategy changed, security improved, and the one caused the other (or at least contributed to the other); I see little way around the obvious conclusion. I hope to see some discussion along these lines in an updated version of his excellent work, In the Graveyard of Empires—so far the best narrative of post-9/11 Afghanistan. I also plan to turn my Afghanistan case study into a book in the next few years. Kyle Lascurettes also raises an issue with my empirical chapters. He is right that I ended up focusing mostly on statebuilders’ choices of the level of invasiveness they used in designing an intervention, rather than on which aspect of statehood they prioritized. He also suggests a sensible solution: “perhaps inadequate levels of invasiveness/control stem from the intervenors’ larger misplaced priorities related to the type of state failure.” This is an avenue for further research, one that would go behind my work, so to speak, to look at the foreign policy decision-making process that shapes interventions. My work took the output of that process—a strategy of intervention—more or less as given without much investigation about how or why such decisions are made. Finally, Kimberly Marten argues that I overlook similarities between contemporary state building and older cases of liberal imperialism that she examined in her work. I agree that such parallels exist and suggested in an appendix further research specifically on the comparisons between state building and the League mandates and UN Trustee system. Roland Paris has similarly suggested that liberal state building is simply the latest costume that the west’s ‘civilizing mission’ wears. It would take a longer study to make that claim adequately—but I note that, even if true, that would not automatically invalidate the idea of state building altogether, only suggest that the United States should continue to cultivate a healthy caution towards it, even as it undertakes future state building missions when necessary—as will almost certainly be the case in Syria, in North Korea if and when it collapses, and possibly in Ukraine when the fighting there eventually recedes. Marten and Jones raise a collection of related issues around my treatment of statehood. Marten argues that statehood is not a self-evidently good thing, criticizes my “idealization of statehood,” and wonders how I would explain the normal barbarity of successful states, like the Soviet Union or Augusto Pinochet’s Chile. She also suggests that intervening powers do not necessarily aim at constructing states. Jones also questions the relevance of my emphasis on states because in some cases the most relevant actors are non-state groups, like militias. I find it odd to be accused of idealizing states when I quote St. Augustine’s adage that states are barely distinguishable from gangs of thieves and murderers, and when I carve out a theoretical space from which to label states “barbaric” (a word choice my editor and reviewers were frankly nervous about). States have been the perpetrators of some of the worst crimes in human history. One of the hardest problems that state building must grapple with is transitional justice: how to cope with industrial-scale violations of human rights, including genocide and ethnic cleansing, that are often committed by agents of the state. Far from idealizing states, I hope my work is infused with a realistic understanding of their dangers—even as I hope to help the project of state building. Part of the strength of my work that Lascurettes highlights (I am grateful for his praise) is its conceptual differentiation, the care I take to tease out different aspects of statehood: it is precisely that differentiation that allows me to say both that Stalin’s Soviet Union was successful at establishing order but was also inhumane and barbaric. Both statements are true, and the former does not implicate me in “idealizing the state” any more than the latter makes my theory uselessly moralistic (a criticism others have raised). I do think that the answer to a barbaric state is an accountable state—not the absence of the state altogether. I see little alternative to the construction of some kind of governing order, the name for which is ‘the state.’ So long as humans go about building things called states, it remains worthwhile for us to ask how to do it right and how to do it most humanely. This is, I hope, a simple recognition of reality, not the idealization of the state. That is why while Jones may be right that non-state actors can be the most effective partners in the short term, it would be unwise of state builders to turn reliance on them into a long-term strategy. In Afghanistan, the United States walked this fine line between local, bottom-up, short-term solutions and long-term state building goals. It partnered with warlords in the early years to provide security, but it also appropriately backed a UN demobilization effort, invested heavily in the construction of a national Afghan army, and sponsored and funded a process for political reconstruction, all of which gradually undermined the warlords. In later years, when the U.S. and Afghan governments experimented with tribal militias and local police forces to combat the persistent Taliban insurgency, it took several tries before they settled on a program design that subordinated the militias to appropriate oversight and control by the Ministries of Defense and Interior. The resulting programs—the Village Stability Operations (VSO) and Afghan Local Police (ALP)—were effective counterinsurgency tools that avoided undermining the very Afghan state they were designed to serve. Unfortunately, by the time such solutions were developed, the state builders’ political will had been exhausted, and the withdrawal began shortly thereafter. The United States and the international community seem to have lost their appetite for state-building projects in the aftermath of Iraq and Afghanistan. From 1989 to 2011, the international community launched an average of more than one state-building operation per year (28 operations in 22 years). Since 2011, it initiated a modest operation in Mali and reengaged, partially, in the Central African Republic. At the same time, the UN completed its mission in East Timor and withdrew in 2012, the United States withdrew from Iraq in 2011, and the U.S. and NATO are scheduled to withdraw from Afghanistan by the end of next year. In the same time frame, the international community has refrained from engaging in several cases that, in earlier eras, would almost certainly have drawn the intervention of outside forces, most dramatically in Libya and Syria. In the conclusion to my book I suggested as an area for further research the comparison of cases of international state building with negative cases; i.e., cases of failed states that did not become the targets of international state building. Such a comparison could highlight what value, if any, state building contributes to lasting peace and justice in places most lacking them. If the international community has indeed lost its appetite for international state-building, we are likely to have a wealth of negative cases in coming years. If Iraq and Afghanistan taught U.S. and allied policymakers the steep cost and extreme difficulty of state-building interventions, negative cases like Syria and Libya (and, earlier, Rwanda) may help to illustrate the costs to the world of not intervening. That offers little comfort to Syrians and Libyans—and Afghans, North Koreas, Ukrainians, and others—whose states have failed to provide order, justice, or any of the public goods which states usually provide. But perhaps policymakers will be able to take counsel from history and approach the subject with both a sense of sobriety and responsibility, neither overestimating what they can accomplish—nor shirking the hard task of international state building altogether. Peter Graff, “Libyan Rebels Overrun Gaddafi HQ, Say He’s ‘Finished,’” Reuters, August 23, 2011. See, for example, Christopher S. Chivvis, Toppling Qaddafi: Libya and the Limits of Liberal Intervention (New York: Cambridge University Press, 2013). Barack Obama, Remarks by the President on the Way Forward in Afghanistan (Washington, DC: The White House, Office of the Press Secretary, June 22, 2011). See Seth G. Jones, In the Graveyard of Empires: America’s War in Afghanistan (New York: W.W. Norton, 2009), 109-133. Ian S. Livingston and Michael O’Hanlon, Afghanistan Index (Washington, DC: Brookings Institution, May 20, 2015), 4-5. The Asia Foundation asked: “How often do you fear for your own personal safety or security or for that of your family these days?” The percentage that answered “always,” “often,” or “sometimes” increased from 48 percent in 2008 to 51 percent in 2009, 54 percent in 2010, 56 percent in 2011, 48 percent in 2012 (a slight decline), 59 percent in 2013, and 65 percent in 2014. The Asia Foundation, Afghanistan in 2014: A Survey of the Afghan People (Kabul: The Asia Foundation, 2014), 32. Stathis N. Kalyvas, The Logic of Violence in Civil War (New York: Cambridge University Press, 2006), p. 107. Also see Ariel I. Ahram, Proxy Warriors: The Rise and Fall of State-Sponsored Militias (Stanford, CA: Stanford University Press, 2011). Thomas Risse, ed. Governance Without a State? : Policies and Politics in Areas of Limited Statehood (New York: Columbia University Press, 2011). Prominent examples include Robert H. Jackson and Carl G. Rosberg, “Why Africa’s Weak States Persist: The Empirical and the Juridical in Statehood,” World Politics 35, on. 1 (Oct. 1982): 1-24; Crawford Young, “The African Colonial State and Its Political Legacy,” in The Precarious Balance: State and Society in Africa, ed. Donald Rothchild and Naomi Chazan (Boulder: Westview, 1988), pp. 25-66; Jeffrey Herbst, States and Power in Africa: Comparative Lessons in Authority and Control (Princeton: Princeton University Press, 2000); and Ken Menkhaus, “Governance without Government in Somalia: Spoilers, State Building, and the Politics of Coping,” International Security 31, no. 3 (Winter 2006/7): 74-106. Examples include James C. Scott, Seeing like a State: How Certain Schemes to Improve the Human Condition Have Failed (New Haven: Yale University Press, 1999), and The Art of Not Being Governed: An Anarchist History of Upland Southeast Asia (New Haven: Yale University Press, 2010). Kimberly Marten, Enforcing the Peace: Learning from the Imperial Past (New York: Columbia University Press, 2004). Max Boot, The Savage Wars of Peace: Small Wars and the Rise of American Power (New York: Basic Books, 2002); Michael Ignatieff, Empire Lite: Nation-Building in Bosnia, Kosovo and Afghanistan (New York: Vintage, 2004). Matthew Rosenberg, “With Bags of Cash, C.I.A. Seeks Influence in Afghanistan,” New York Times, April 28, 2013. Stephen D. Krasner, Sovereignty: Organized Hypocrisy (Princeton: Princeton University Press, 2000). Alexander L. George, and Andrew Bennett. Case Studies and Theory Development in the Social Sciences. MIT Press, 2005. Seth G. Jones, In The Graveyard of Empires: America’s War in Afghanistan. WW Norton & Company, 2010. Roland Paris, “International peacebuilding and the ‘mission civilisatrice’,” Review of International Studies 28, no. 04 (2002): 637-656.